Ok, the title of this blog may not be the best. 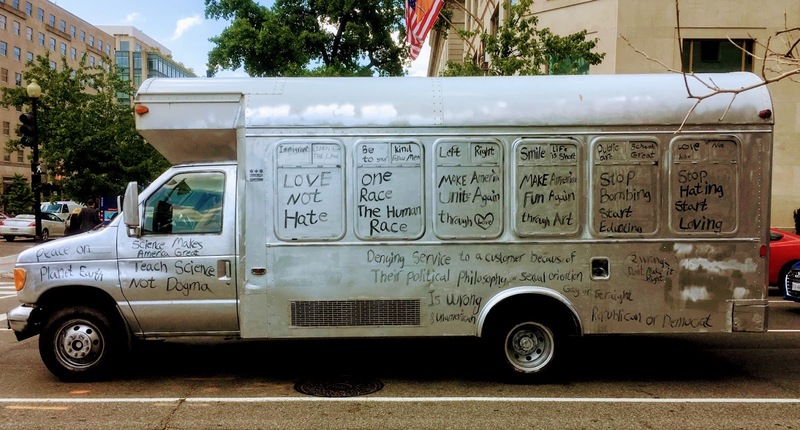 Some may associate the “Love Truck” with human trafficking or something horrible. Left, right, make America unite again through love. 2 wrongs don’t make it right. I almost got to wonder what’s on the other side of this truck??? Anyway, I know it’s more than kind of kooky to graffiti up your own vehicle this way, but I still rather see these messages and actions than those of hate and violence in this world. This entry was posted in Bigotry, Brotherhood, Communications Management, Compassion, Discrimination, Education, Graffiti, Human Relations, Humanity, Kindness, Love, Peace, Photo, Politics, Prejudice, Racism, Tikkun Olam, Transportation, Trucks, Uncategorized, Unity, Washington D.C.. Bookmark the permalink.